Go ahead. Say it like Tom Hanks! Or…. Try to not say it…in your head. No comments left again, so I don’t need to fake an apology (who am I kidding? so not happening!). I do get rare comments on my Goodreads.com reviews, but not my blog. Still, I built it and they still come. There’s something lasting about that guy, and I will never understand what it is. Usually pertains to a meaningless meeting. Blog stat…BOGSAT. Both worthless. Unlike Tom Hanks, I’m not sorry [Robert Anton] Wilson. You were a nut who didn’t like people smarter than you (the Committee for Skeptical Inquiry) who picked on your hero, Wilhelm Reich, for quackery. 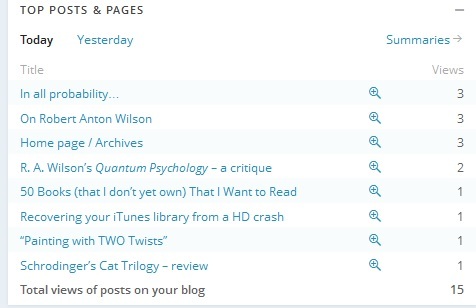 Amazingly, I still get page hits from folks looking for Robert Anton Wilson, sometimes by the name but a lot of times for Quantum Psychology…a book I critiqued four years ago. Occasionally, Discordianism searches lead folks here. Discordianism is centered on the idea that both order and disorder are illusions imposed on the universe by the human nervous system, and that neither of these illusions of apparent order and disorder is any more accurate or objectively true than the other. It was hard to tell if Wilson really took himself as seriously as he came off, but my bet is yes given the vitriol he spewed at Carl Sagan, the Committee for Skeptical Inquiry, and for some really weird unexplained reason, Martin Gardner…whom he never met. So, with the tags on this short blog entry, I can be assured that more Wilson followers will find my little illusion of order and randomly mused disorder. In Quantum Psychology, Robert Anton Wilson extrapolates quantum theory basics to metaphysical musings. Well, I don’t think he saw them as metaphysical. It’s a wandering trek from a reasonable survey of quantum mechanics through odd theories of something he calls Transactional Psychology, peppered liberally with his strong dislike of the Catholic religion and the skeptics of the Committee for the Scientific Investigation of Claims of the Paranormal…now Committee for Skeptical Inquiry and certain contributors to the CSI, ultimately arriving at his new quantum psychology. I do think Wilson makes some good points in this book, but he also makes some very bad ones and fails to catch his own transgressions against the rules he is trying to promote. In his “Fore-Words”, he notes, among many other things, that “we […], quickly and unconsciously, ‘fit’ the data to our pre-existing axioms, or game-rules, of our culture (or our sub-culture).” I agree. His summary of pragmatism – “the best we can say of any theory consists of ‘Well, this idea seems to work, at least for the time being.’” – is spot on. Where I think he falls short is his rendering of quantum theory. I would argue that quantum “rules” do not apply to a macro level any more than Newtonian and Einsteinian “rules” apply on a quantum level. And certainly not to something as variable as psychology. Yes, given the statistical nature of quantum physics one might think they pair up well, but Wilson invents a quantum consciousness to explain non-local pairing of actions virtually anyone in the world would term coincidence. For the quantum theory part of this book, the rewording of the complex concepts reflects well on Wilson’s journalist skills. His biases and smugness unfortunately detract. The Copenhagen Interpretation then means, not that there “is” no “deep reality”, but that scientific method can never experimentally locate or demonstrate a “deep reality” that explains all other relative (instrumental) “realities”. Maybe we cannot know “any” reality, but I think we can know “most” of a reality insofar as it is apparent to us. If the alternatives, theoretical or perhaps practical, are impossible for us to perceive, then aren’t they really irrelevant on a macroscopic scale? And he offers “In short, we can know what our instruments and brains tell us (but we cannot know if our instruments and brains have reported accurately until other researchers duplicate our work… )” I agree completely. But, the principles of convergence of data, corroboration of observations,… statistical majorities… mean that we can know most of what we observe is the best model for what we observe. You create your own model of reality, or you create your own reality-tunnel (to borrow a phrase from the brilliant, if much maligned, Dr. Timothy Leary), or (as they say in sociology) you create your own gloss of the “realities” you encounter. He spends a lot of time arguing circularly that the universe only exists in our heads which are contained within the universe we perceive. Page 55 rambles in a semantic sleight of hand, proving that we are our own grandparents (not really that example, but that’s the concept.) He then regresses into an exercise of infinite regression and circular logic in trying to identify how we can perceive that we perceive with “but wait, there’s more” just around the corner. In Chapter Six (“The Flight From Reason & The Cult of Instruments”), Wilson talks about feedback loops of “increasingly subtle instruments” needed to tell us “where and when the Universe failed to agree with our Logic or our math.” But he hangs his argument refuting measurement and observation (two hands, hot & cold water, then together in one tepid bowl) without the explanation for the observation. It’s clear (to a scientist) that the self-correcting logic and measurement tandem work well to establish and refine models and theories. I recognize he’s arguing against Pure Reason, but I don’t think it’s a valid argument. Wilson does note “the axioms (game rules) that seem natural or undeniable in one tribe or culture do not seem at all natural and are often denied in other cultures.” Excellent point. Rules are relative. Chapter Seven (“Strange Loops & the Infinite Regress”) wraps up part One with speculation and the beginnings of deviation from – my assessment – sound science. Wilson in a single question without follow-up asks the reader if J.W.Dunne’s infinite regress of consciousnesses in time is expected. A little digging reveals Dunne believed he experienced precognitive dreams containing “past & future events”. So parapsychology is finally introduced (one should obviously expect so from a book titled “Quantum Psychology”.) I wonder if Dunne ever considered how his “knowledge” of the alleged future events affected the outcome of those events. Wilson cites coincidence as “inescapably link[ing] Quantum Mechanics with daily-life psychology or ordinary kitchen-sink consciousness.” He even posits “[a]t this point some readers may want to bail out or throw the book away” – but I persevered. Wilson dismissed a thermodynamic probability that air being evenly distributed in a space is not 100% – he dismisses the insignificant as negligible yet cries about how do we know anything for sure? I have called the ideas herein Quantum Psychology because the consequences of Relativity, Uncertainty and Indeterminacy have literally earth-shaking implications for our daily lives, our “mental health,” our relations with other humans, and even our deepest social problems and our relations with the rest of the Earth and the Cosmos itself. As Count Alfred Korzybski noted in the 1930s, if all people learned to think in the non-Aristotelian manner of quantum mechanics, the world would change so radically that most of what we call “stupidity” and even a great deal of what we consider “insanity” might disappear, and the “intractable” problems of war, poverty and injustice would suddenly seem a great deal closer to solution. Why “literally earth-shaking”? And the italicized is a rather bold statement – and without support. That is, Wilson provides none. In the next chapter on quantum logic, Wilson talks about a coin flip and asks what state the coin is in before it hits the floor. He’s trying to set the Schrodinger’s Cat stage, but I’ll argue it doesn’t matter what state the coin is in – we’re only concerned with (we only measure) the end state. Now, if the intent of the experiment is to identify a state during the flip, then the conditions of the observation are poorly defined. It’s a misleading scenario, and one of many to follow. In the yes/no/maybe of John Von Neumann’s logic, Wilson says the coin during the flip is maybe. But is that even useful? Wilson states that people ignore the quantum maybe because they haven’t heard of quantum logic or Transactional psychology. I submit maybe they ignore it because “maybe“ doesn’t always apply. Has nothing to do with quantum logic or Transactional psychology. However, aside from Catholics, Marxists, Objectivists and a few other dingbat groups like the Committee for Scientific Investigation of Claims of the Paranormal or the Hard Shell Baptists, most of us, in this technological age, have at least a dim awareness that no coordination of words, however skillfully orchestrated, quite equals the whole universe. Whoa. “other dingbat groups”? So Catholics, Marxists and Objectivists are dingbats? Not a good way to make your point, sir. And of course, CSICOP is lumped in there, because Wilson hates the organization. And any skeptical group like CSICOP that pans Wilson’s pet pseudo-sciences is necessarily dingbat. He plays with semantics with an absurd train of thought about what does the word “water” mean and how the word does not only equate to a single experience but it cannot encompass all possible experiences. Um, okay. Who thinks it does? We’d have a Chinese alphabet of words – it’s bad enough how many are already in our languages. There is no one size fits all, and it is silly to think there could be, thus the argument is pointless. We use words to represent concepts. We need not know the mass and arrangements of the quarks that make up the sub-atomic particles that in turn make up the atoms that form the molecules that are water. That which we know as water is water, regardless of state. The rose is a rose argument. But I’m leading the conclusion Wilson is working toward…. 2. “Water” is a word. Got it? No, you probably haven’t. Not yet. You only think you’ve got it. ..
A couple of the devices I noticed Wilson using are pronouncements without cites and name drops without lead ins. Page 149, he says of different personalities when drunk or sober, “[t]hus, most people have noted that something that happened to them while drunk appears totally forgotten, until they get intoxicated again…” Most people? I would challenge that, but of course, there are no references for the statement and Mr. Wilson is no longer available. And that observation appears to be a summary of a “Dr. Rossi” who had something to say about separate personalities. I looked up “Dr. Rossi”, found an Ernest Lawrence Rossi whose bio/profile fit the Wilson model (hypnosis) but didn’t have much to follow up on. Oh, LSD makes another appearance in the same paragraph. E.g., if raised Catholic, they seldom become agnostics or zetetics; rather, they will move, like iron filings drawn by a magnet to dogmatic atheism, or even a crusading atheist “religion” like Marxism, Objectivism or CSICOP. Agnosticism and atheism are not mutually exclusive, one can ascribe to both. And religion in quotes doesn’t save you, Mr. Wilson – that’s immature. The ubiquitous direct dig at CSICOP is funny, because Wilson’s favorite CSICOP target, Martin Gardner, was a theist, not an atheist. As a trained psychologist (from a university without accreditation that no longer exists) I am surprised that on page 151, Wilson implies that disturbed or unhappy “imprints” may account for opiate addictions. “May”? Is that like “alleged”? Where is the basis for that pronouncement? And has he no understanding at all as to how opiates affect the nervous system? “May” starts showing up a lot at this point in the story. He suggests a “Winner Script” (attitude?) as contributing to longevity and “may” account for Bertrand Russell writing at 99, George Burns working at 100. That “may” sidesteps other explanations such as different genetics. Benjamin Franklin appears (from the records) to have enjoyed life immensely, yet died younger than both Burns and Russell. Of course one can find instances to support the “may” conclusion, but if one counted all those that don’t as well, the “may” may well turn out to be an aberration. That’s manipulating the data and not scientific at all. His explanation of drunks using phrases relating to the exit of the alimentary canal (“Up yours, buddy,”) as stemming from “toilet training and mammalians habits of using excretions as territorial fight-or-flight signals” is so bizarre at to be comical. I guess Wilson was not privy to knowledge of animal intelligence as he states that language as a “time-binding function of symbolism gives humans problem-solving capacities impossible to most other animals (except, perhaps, cetaceans).” Or ravens, chimps, bonobos, elephants, octopuses, many other species of birds, etc. My notes in the margins start getting longer at this point. He says electrons in quantum mechanics have a different essence each time we measure them and equates that to us jumping from different information systems. Electrons don’t have different “essences” unless he is saying that our readings change the actual electron. The information we know about an electron changes, but the “essence” doesn’t and the correlation is misleading, as humans use different information systems to process our perceptions. The logical fallacies mount up. His biases accelerate, assigning absolutes to James Randi – as in Randi insisting on a fraud existing – in assessing an illogical thought experiment: non-locality effects illustrates by a billiard table without players and with no outside force, one ball suddenly turns clockwise and another turns counterclockwise. Of course Randi would cry foul…for the example cited…but I’ve never seen/heard/read Randi commenting on quantum mechanics. One of the problems of quantum concepts is trying to imagine physical corollaries to the theoretical and in this case, the billiard ball example not only doesn’t work, it can’t work. Has anyone ever made a claim of quantum non-locality applicability to billiard balls? In that respect, Randi would be right. On a sub-atomic level? Even Randi would not make that judgment as it would be unanswerable without the math and extremely special instrumentation. And for whatever reason, Wilson really didn’t like Catholics, or the Catholic religion. One can’t even try to use the “thinly veiled” argument – he is outright denigrating.